In the late 19th century, the Italian scientist Camillo Golgi developed a painstaking staining technique that revealed fine details of the nervous system. Continuing in that tradition, the Geisel School of Medicine’s Miguel Marin-Padilla has been using Golgi’s method to unravel the brain’s secrets for nearly five decades. By permeating brain tissue with potassium dichromate and silver nitrate throughout a four-day process, the method clearly stains a random selection of cells in their entirety and reveals the connections between neurons. In the late 19th and early 20th centuries, Spanish scientist Santiago Ramón y Cajal adapted and used the technique in his pioneering investigations of the microscopic structure of the brain, and, in 1906, Cajal and Golgi shared the Nobel Prize in Physiology or Medicine for their work. To find out how Cajal, considered by many to be the father of modern neuroscience, was able to see and understand so much, Marin-Padilla traveled to the Cajal Institute in Madrid, Spain, in the late 1960s, when he was starting his research career at Dartmouth, on a National Institutes of Health Neurohistology Fellowship to study the technique. 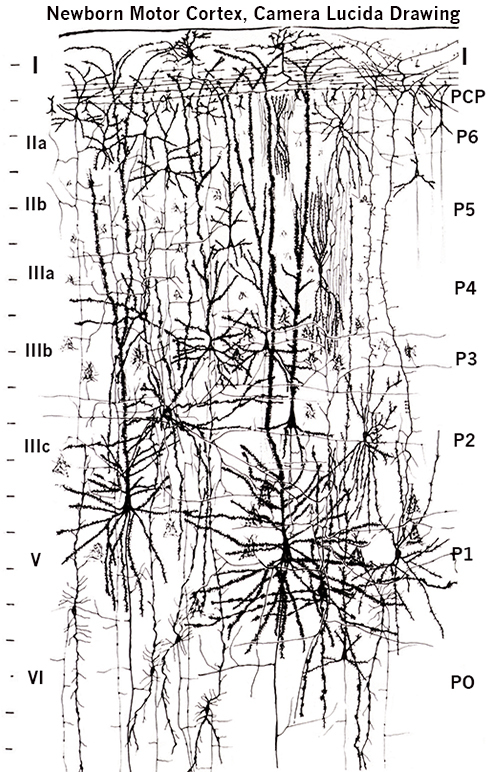 This example of a camera lucida drawing created by Marin-Padilla from a series of Golgi preparations shows the neuronal composition of the motor cortex of an infant. Following in Golgi’s and Cajal’s footsteps—both made beautiful drawings of what they saw through their microscopes—Marin-Padilla created artistic and elegant drawings that illustrate what he sees in thousands of miniscule bits of brain tissue. His dedication to the Golgi method has led to many important discoveries. His work was instrumental in establishing that neurons do not extend their branches up to the superficial layers of the cortex (as was commonly believed), but elongate from the top of the brain downward. He provided some of the first information to show that abnormally shaped neurons correlated with cognitive difficulties in children with Down syndrome or those who developed epilepsy as a result of perinatal brain damage. He has provided detailed descriptions of how blood vessels grow into the brain as it develops. Finally, his work has contributed to understanding the fundamental principles that govern the embryonic origins of the mammalian cerebral cortex. 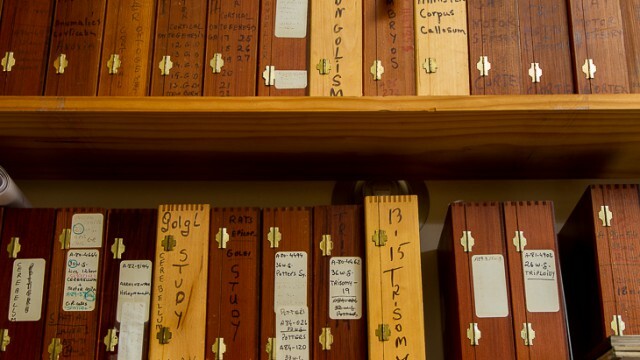 Since his retirement 14 years ago, Marin-Padilla has spent a fair amount of time in a room at his house that he calls the "Sancta Sanctorum," which houses his collection of more than 5,000 pristine rapid Golgi preparations, his old microscope, and many books. He has contributed to several books on neuroscience and has gathered his Golgi observations into a book on the prenatal development and structure of the human brain motor cortex—The Human Brain: Prenatal Development and Structure (Springer, 2011), which is dedicated to his beloved late wife, Teresa. His recent paper, his 158th, on the brain’s vascular system, “The Human Brain Intracerebral Microvascular System: Development, Structure and Function,” published this winter in Frontiers in Neuroanatomy, has captured the imagination and interest of scientists. In 1977, Marin-Padilla wrote an article for the medical school's alumni magazine about how he first became interested in studying the brain. Read the full article here [PDF]. While Marin-Padilla is humble about his accomplishments, he is aware that the technique he believes in and has used for nearly 50 years sets him apart from other neuroscientists. And because of the patience and dedication the Golgi method requires, there are few, if any, willing to follow in his footsteps. Enthusiastic and as devoted as ever to using the Golgi method, Marin-Padilla isn’t sure what the future holds. Dr. Marin-Padilla taught general pathology to Dartmouth medical students and developmental pathology to pediatricians and neonatologists for more than 40 years. At the Geisel School of Medicine, the Miguel Marin-Padilla Lectureship for Excellence in Medical Education and the Miguel Marin-Padilla Medal were established in his honor.